Further distributors: Please contact us or visit http://www.dis-sensors.com/en/our-distributors. With the QG65, DIS Sensors offers a highly robust inclinometer that measures up to a full 360º rotation single axis or up to ±90° dual axis with respect to the earth gravity (without reference parts). The QG65 has a CANopen interface for easy communication. DIS Sensors has extended the QG series of sensors with CANopen safety sensors with built-in redundancy for safety-critical applications. The safety is provided by features such as the redundant (dual) functionality, communication via the CANopen Safety Protocol EN50325-5 (CiA 304), and continuous verification of correct operation of all components. 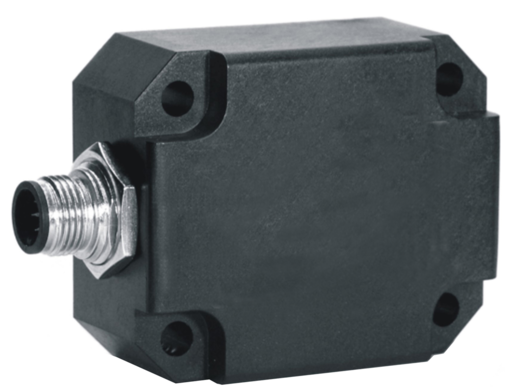 For active temperature compensation DIS Sensors also offers a high accuracy model with CANopen output, a resolution of 0,001° and an accuracy of 0,04° over the entire temperature range. The QG65 measures a full 360º angle in the vertical plane. This is especially demanded for electronic control of the arms of e.g. mobile cranes, where angular movements greater than 180º occur. The complete covering of the 360º angle provides an easy mounting of the QG65. The QG65 is also available for measuring dual axis tilt in the horizontal plane (±90° or ±30°). The QG65 inclinometer is highly shock resistant. The micro-electronics is potted in a compact reinforced plastic, die cast aluminium or stainless steel housing (IP67). Two M12 connectors (male and female) provide an easy ‘loop-through’ cabling of the CANopen interface. The operating temperature range is -40 to +85 ºC. The device is easy to mount anywhere on a tilting object as it does not need another object as a reference. Each QG65 is individually calibrated and the calibration values are stored into the internal EEPROM. The resolution is 0,01º (X series 0,001°) and the accuracy is up to 0.05º typical. Mechanical offset-errors due to mounting can be easily eliminated by a centering-feature via a CANopen command. CANopen parameters can be factory set in the internal EEPROM (e.g. the default node-id), but can also be changed in the field via specific CANopen commands. All models are EMC tested by a Notified Body, from basic EMC standards up to Automotive, Agriculture, Industrial Trucks, GL, DNV etc. Visit www.dis-sensors.com/downloads and select ‘declarations of conformity’ for details. UL/CSA is optional available on all models. Further we also provide some models with E4 Type approval.